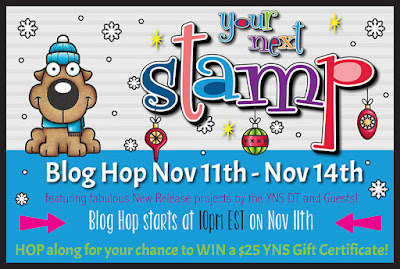 Hollybeary Creations : YNS November Blog Hop!! 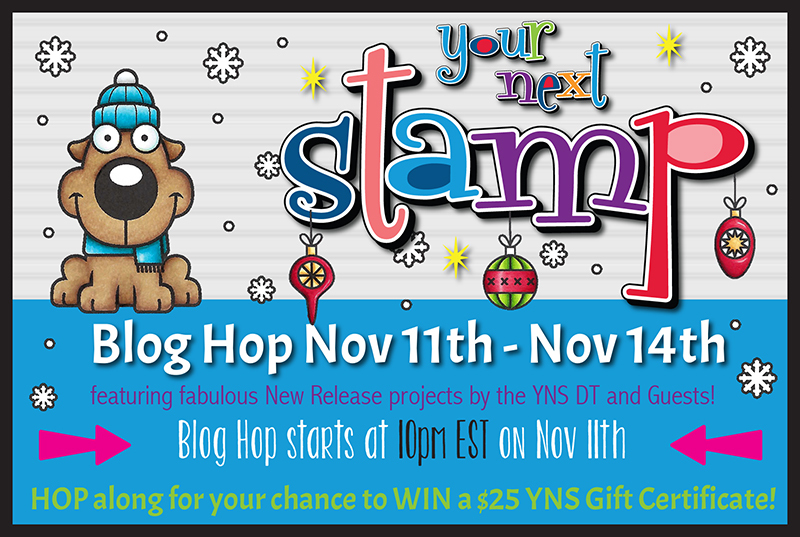 It's time for the November Release from Your Next Stamp... All the products are now available in the shop and we have a Fun Blog Hop where you can Win a $25 GC to the store. My first project features the new Merry Mouse Joyful Greetings and the Snowflake Panel Die. I created an Ombre background on a piece of Distress Watercolor paper with Tumbled Glass, Salty Ocean and Blueprint Sketch Distress Inks. Then I die cut the panel with the Snowflake Panel die. I stamped the sentiment in the center and heat embossed it in White then I adhered the panel to a White card base with some foam tape. I stamped the image from Merry Mouse Joyful Christmas onto some X-Press it blending cardstock using Black Olive ink and colored it in with Copics. Then I used the coordinating die to cut it out. I adhered the image to the panel with some foam tape. I added some Gold and Clear Glitter Nuvo drops to parts of the image. For my second project, I used the Snowflake Panel die and the negative pieces I had left over. I die cut the panel from a piece of White and adhered it to a White card base. Then I paper pieced some of the snowflakes and dots into the snowflake panel. I added some BLue Glitter Nuvo drops into some of the small dots and then some Clear Glitter Gumdrops as well. I stamped the sentiment in the corner of the center panel with VersaFine Black ink. I stamped the bird image from the new Tweet Love Birds set in Black Olive ink and Colored it in with Copics. I used the coordinating die to cut the image out and adhered it with some Foam tape. I added some Silver and Clear Wink of Stella to parts of the image. This is another great Holiday Release!!! Hope along with us and be sure to leave comments along the way for a chance to Win a $25 GC to the store. And we have a special Sale in the store as well! Great designs, Holly. Love the snowflake panel. I loved your card samples.....they are sooooo cute. Thank you so much for sharing...Happy Holidays!!! Awww, love the Tweet Love Birds!! So adorable with the one holding a mistletoe branch! That snowflake panel is pretty awesome; that's going to be a hit for sure! What an awesome idea for using the negative pieces! Such fabulous cards! Love the cards and the backgrounds are amazing! Very pretty! I love the sharp contrast with the dark blue and white - makes your card really pop!! Love your backgrounds! What a great idea to make use of the leftovers from one card for the other. Brilliant and such cute cards! I like how you inlaid your die cuts and that mouse card is so fun. These two cards are just perfect !! The reflection of the mouse in the ornament is just amazing !! This is an adorable stamp and card! I really like the colors you used on it. I just adore these birds! Love both of your cards and love the way you have combined the die panel and stamps. Great use of the panel die - the blues are so pretty. Cute cards! I love the new snowflake background die and the Tweet love birds set is adorable. Beautiful! I love the snowflake panel die! That looks really fun to work with! TFS! Wow!!! How funny and festive!!! Awesome cards!!! Such wonderful creations Holly. I just love how you sponged the snowflake panel. Great ways to use the panel die. And the mouse with his reflection on the bulb is so cute! These are so cute!! Love your coloring and use of the snowflake background die! I love the blues in this. Very pretty card. Such cute cars! Your Tweet Love Birds card is amazing! Adorable cards. Those birds under the mistletoe are too cute. Thanks for the inspiration. Love that snowflake panel...your bird cards are so "tweet." :) Beautiful work! So cute with the ombre snowflake backgrounds. Love how you used the snowflake oanel die.